A second episode of Jeremy Clarkson’s new show filmed in the Highlands will go online later this month. Clarkson and co-hosts Richard Hammond and James May filmed two episodes of The Grand Tour on the shores of Loch Ness in December. 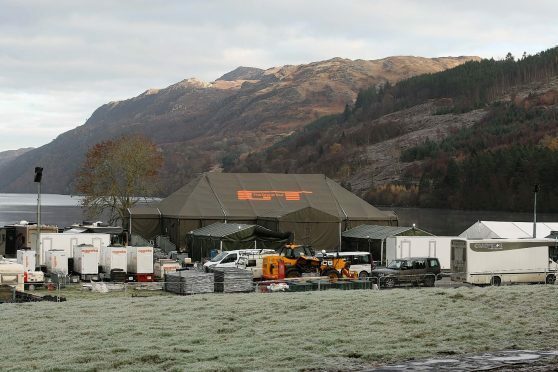 The trio filmed scenes in their giant studio tent at Fort Augustus – joining Palm Springs in California and Lapland on the list of locations used for the show. The first episode will become available on Amazon Prime this Friday. And a second episode showcasing the Highland scenery will become available on Friday, January 27 as well. Promotional material from Amazon for the show said the hosts chose to stay on in Scotland for a second episode after a mysterious find after the previous episode was filmed. The episode – entitled “(censored) to (censored)” – will see the three presenters test exotic cars on a road trip around central Europe “taking in some of the most grown-up and not at all childishly rude place names the region has to offer”. It follows this Friday’s episode which shows the trio traveling around northern France in three used Maseratis. The high profile trio caused quite a stir when their tent arrived in Fort Augustus in early December. The presenters were spotted taking a walk around the Caledonian Canal ahead of filming taking place. They even stopped for fish and chips at The Lock Inn in the centre of the village. The show’s decision to film at Loch Ness was hailed by local business leaders as a major boost for the local economy, with The Grand Tour watched all around the world. The location was praised by Clarkson during filming who describing the view from the tent as “mesmerising” on social media.